It's pretty weird of Korg to create such a device in these times when everything is done with a computer. In the end, this is what anyone may be wondering with this Microsampler ─ the umpteenth version of the very lucrative Micro series of the Japanese brand. Sampling frequencies: 48kHz, 24kHz, 12kHz, and 6kHz. 160 seconds of sampling at 48kHz. 5 sampling modes (ONE SHOT, GATE, LOOP, KEY GATE, and AUTO NEXT). Sampling sources: Audio IN (Mic or Line) and Resampling. 128 motifs (patterns), configured in 8 banks of 16 patterns. Number of bars per pattern: From 1 to 99. 21 types of effects, including the effects of the Kaoss Pad: General effect and insert effect. Built-in mic for fast sampling. Loop recording in real time. Import/export of WAV/AIF files via the USB interface. It can be mains or battery-powered. It was conceived as a portable and mobile tool. It's not complicated, but the manual is indispensable to find your way. In this regard, the manual is fairly well-done and instructive. For editing, everything goes swiftly with the "write" button. The sounds included in the banks of the MS aren't very interesting, except for one or two maybe. So you'll have to import everything you have in your head and play it quickly. Good sample reproduction at 48kHz, it's pretty smooth and the sound is clean, which is much more important. Effects are all right but a bit disappointing, in the sense that you can only choose one at a time. Other than that, it has good dynamics and the sampling system is all right, without being an experimenting nor synthesis beast. Because there's not much to do at this level here, no filters, no specific parameters, no complex editing. Sound goes out as it comes in, with the bare minimum in terms of editing. 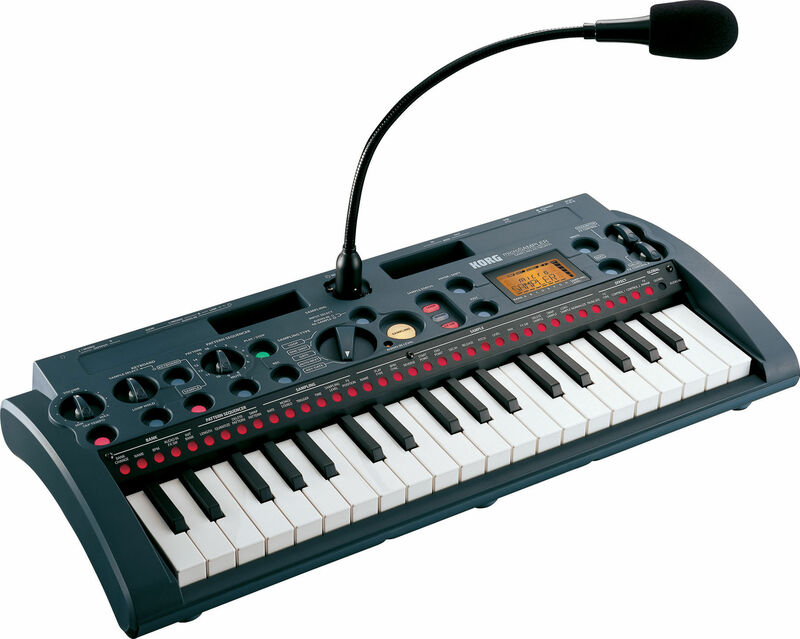 The small sequencer is a very good idea, it's the kind of stuff that allows you to quickly build an idea or that can come in handy in case of emergency onstage. The effects aren't bad, but it's impossible to choose one per sound, you have to do it at the bank level and then you determine the dry for each pattern. It's not great, but it spares you from having to carry an effects rack around, so it's interesting anyway. 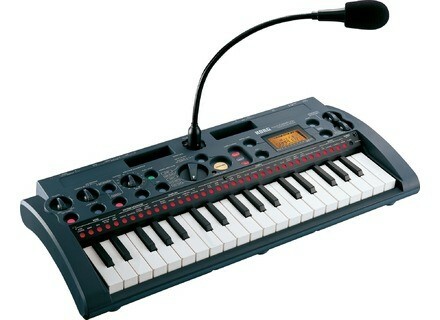 You have to take the Microsampler for what it is, a portable sampler to take your sounds anywhere. It has nothing to do with an Ensoniq ASR10, an EMU 3, an Akai S3000 or the more recent Octatrack. It's not a experimental tool transcending the imported sounds, but rather a sample player with keyboard. People who buy it with the intention to revolutionize their set with the "sampling" legend will be disillusioned very fast. It's ideal live, for mobile musicians and also for people who don't have the means to buy all sorts of instruments, but who want to get out of their PC/Mac. The Microsampler is, in my opinion, a very interesting unit. But you shouldn't expect from it something it can't do. Its "plastic toy" aspect doesn't annoy me, because its lightness and the services it provides are more worth than its looks to me. At the price you can get it secondhand today (it's a bit expensive new), it's a trustworthy companion given its simple but solid features.